Recently I attended a mortgage seminar at which credit guru Doug Minor was a featured speaker. Doug is a nationally recognized expert with specialized expertise in the Fair Credit Reporting Act (FCRA), which protects consumers in their dealings with credit bureaus. Why is this important? Because more than one fourth of all credit reports are estimated to have serious errors or inaccuracies. The FCRA provides a mechanism for consumers to dispute those errors. The tricky part is knowing what to do (and what not to do) when attempting to effect repairs. 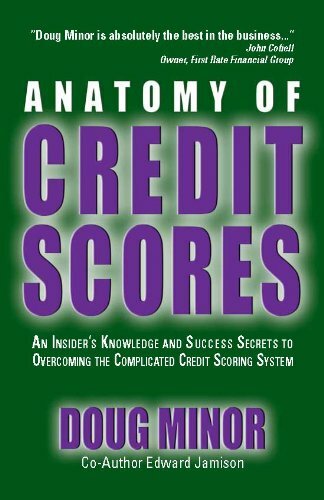 In his book Anatomy of Credit Scores, Doug provides a blueprint for rectifying credit report discrepancies and attaining the best possible credit score. To facilitate the process, sample letters are provided that can be tailored to individual disputes. Also, letters to credit bureaus shouldn’t sound like they were drafted by a team of lawyers. Keep the message simple and straightforward so that anyone can understand what you’re requesting. There is an element of chance involved. Bureaucrat A may be more lenient and understanding than Bureaucrat B. Even if your bill-paying record is excellent, you’ll want to know where you stand with the Big Three–Equifax, Experian, and TransUnion–before seeking to establish a new trade line. Under the 2003 FACT Act, these credit bureaus are obligated to provide one free credit report every 12 months upon request by the consumer. If you’d like to make a request online, go to: www.AnnualCreditReport.com. I’m in process of refinancing two properties, and am so grateful to have this insider information at my fingertips. A high credit score translates to thousands of dollars in savings over the life of a loan. As president of Easy Credit Relief, Inc. Doug Minor offers a menu of services to his clients, including credit repair, credit monitoring, identity theft recovery, and divorce recovery. 1 Do You Know Your FICO Score?